We want a more filling breakfast than cold cereal or toast, but don’t want to get up a lot earlier. Here’s the answer: over-night cereal. Before going to bed, boil some water. 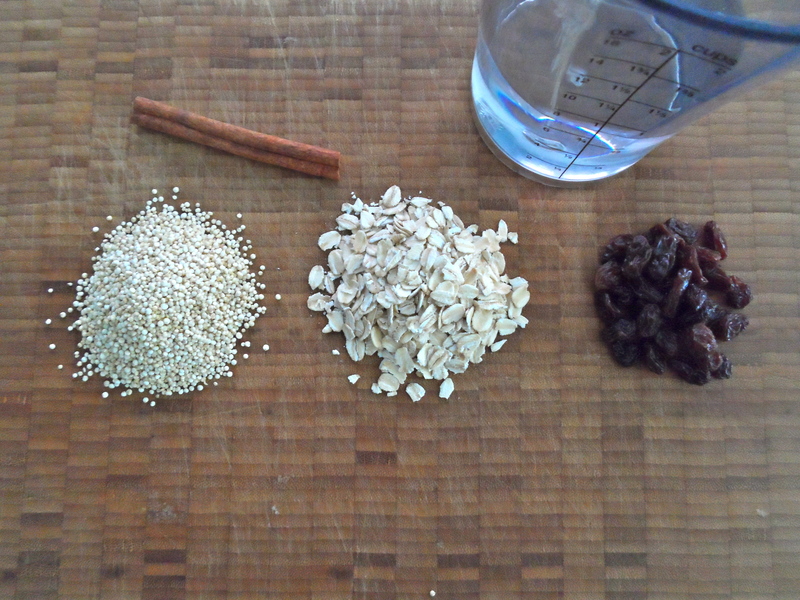 Add grains and dried fruit. Cover and turn off the heat. Go to bed. Wake and your breakfast is waiting. I used oats for the classic oatmeal feeling, and quinoa for flavour and protein, to make us feel full longer. But, I plan to mix and match the grains, trying out new combinations to find what tastes -and cooks- best. Stir well, cover, turn off heat. In the morning since the pot is already on the stove, you can heat this up a little while the coffee brews, or eat it straight away like boxed cereal without the crunch. Add a little milk to the bowl, and some honey or maple syrup, if you like.